So, this card is also a 5 x 5 and the fun pattern papers are again from MME Haunted collection. 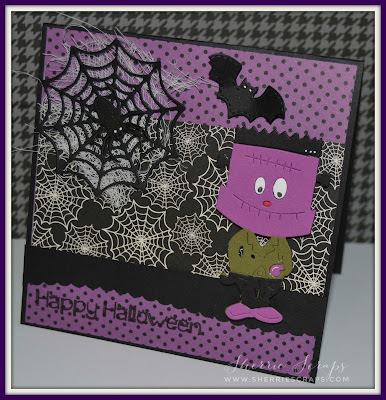 The zombie is Cheery Lynn Designs~Monster Kid Dies. The web, bats and spiders are from Jaded Blossoms Halloween Dies. I tucked a little cheesecloth behind the web for a fun look. 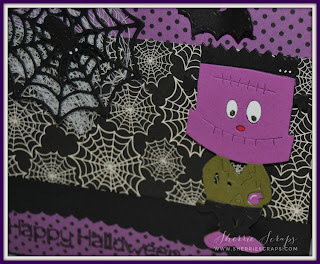 The border is created with the Border Dies 2 and the sentiment is stamped with the Halloween Treats 2 stamp set. So Stinkin' CUTE! LOVE the Zombie! ADORABLE!!! Have a Great day! I Love this Sherrie. So Cute! I am getting ready to make my Grand Kids Cards for Halloween. Your creations are an Inspiration to me. Thanks for Sharing. Oh wow! This is too cute!! Love the purple zombie! Oh, I love this one, too, Sherrie!! The purple Frankie zombie is so adorable!! I so have to get those dies!! The papers are beautiful!! Love this my friend!! Totally makes me smile!! Thank you so much for playing along at DL.ART!! Sherrie this is so cute! So sorry I haven't been commenting on all of your adorable posts, I've family in town and that has consumed me! Too cute, love the purple and black! Adorable card! I'm loving the zombie themed cards you have been creating! The color combination for this one is awesome, love the purple and black! I also love the dies you used, super cute! Cutest Zombie EVER!!! Don't think he would last long on 'the walking dead' being that cute and all! LOL!!!!! SO cute! Love your little Frankie here, and what a fun design! 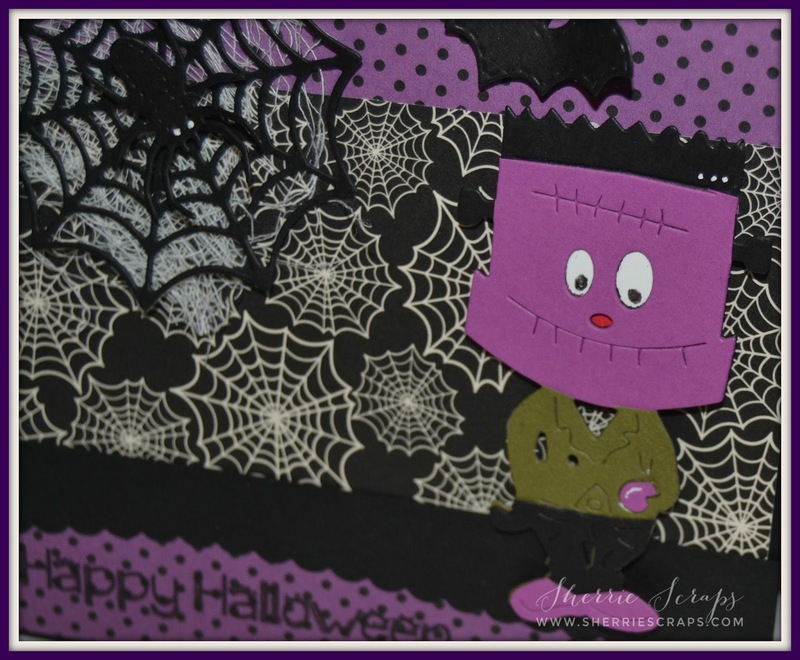 Love those spooky papers and love the spider web and bat, too! That little zombie is just way TOO cute!! I want him..lol! I can't stop smiling!! Spooky cute my friend!! What a super cute Halloween card!! Love that zombie!! Have a great day. Very cute card! Thank you for joining us at Let’s Craft & Create challenge. We hope to see you again. Super cute Sherrie! What a fun zombie! This is so fun!! I just love the look of that sweet zombie and the cheesecloth is such a super touch behind the web! Oh he's so CUTE, love the colors they are terrific! The webs looks awesome! 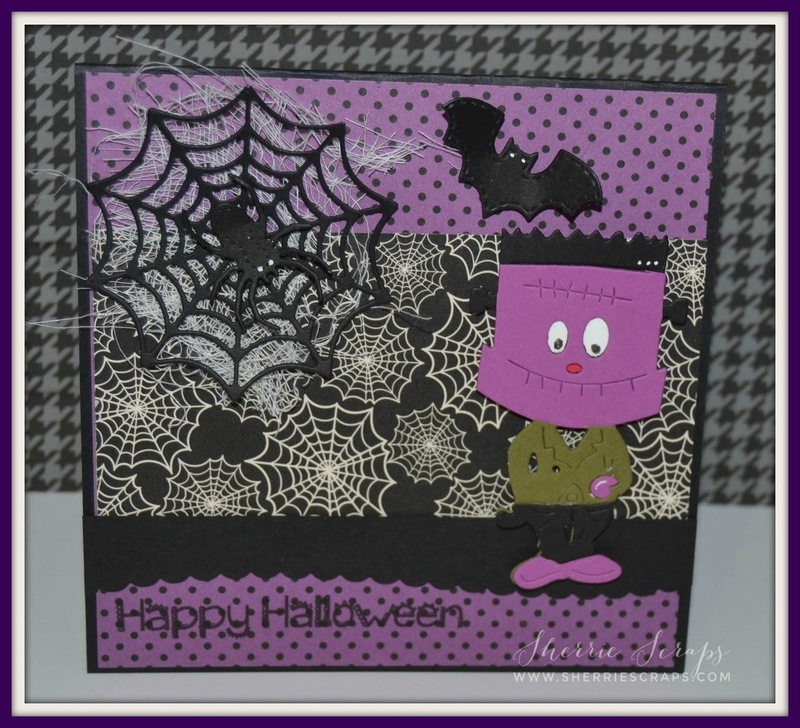 Fun spooky Halloween card! Thanks for joining us this week at HIMCR! Such a beautiful card! I love the colours and layout. Thank you for sharing with us at Let's Craft and Create, good luck and I hope you will join us again. No this one is cuter than the one before. What fun Halloween cards.